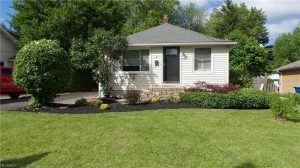 Charming updated home! Fresh Paint and Landscaping. 3 bedrooms, 1 bath, eat in kitchen with breakfast bar, french doors to deck overlooking large back yard. Hardwood floors throughout. 1st floor laundry. Full unfinished basement.